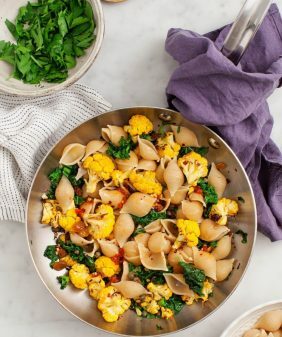 This creamy vegan pasta is entirely nut-free - the tangy, luscious sauce is made of blended white beans, lemon juice, and nutritional yeast! I finally got my pantry in order. Ok, that’s not totally accurate – it’s a mess of nuts, seeds, oats, and flours all piled on top of each other because nothing has “its place” yet in the new kitchen. But the fact that I have most of the essentials at least in there is progress (right?). 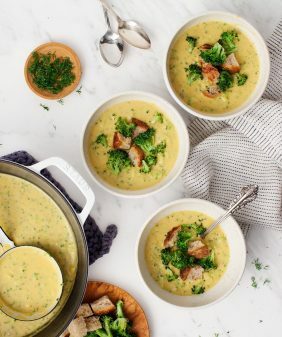 So when I brought this beautiful broccoli home from the farmers market a few weeks ago, I turned to my mostly-stocked pantry to make my broccoli – stems, leaves, and all! – into a full meal. What came out is this creamy white bean puree that I poured over shells and broccoli. One thing about this recipe – it’s not mac & cheese. I know it looks cheesy and there’s an option below to use cheese if you don’t want to use nutritional yeast, but this sauce isn’t meant to recreate cheese. It’s lusciously bean-y, a little tangy, super homey, and delicious in its own way. 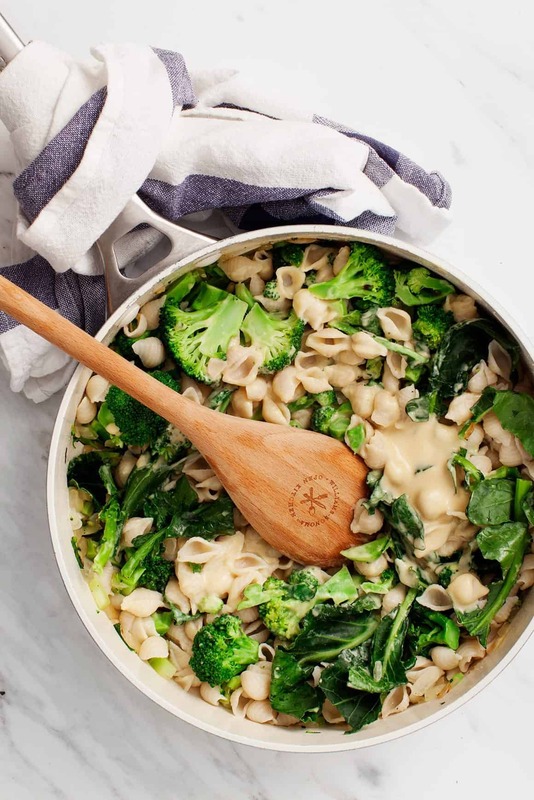 I serve this the way I serve most saucey pastas – mix most of the sauce into the pan with the broccoli and the shells, and reserve the remaining sauce to spoon on top of the portioned bowls. Are you a creamy pasta fan? 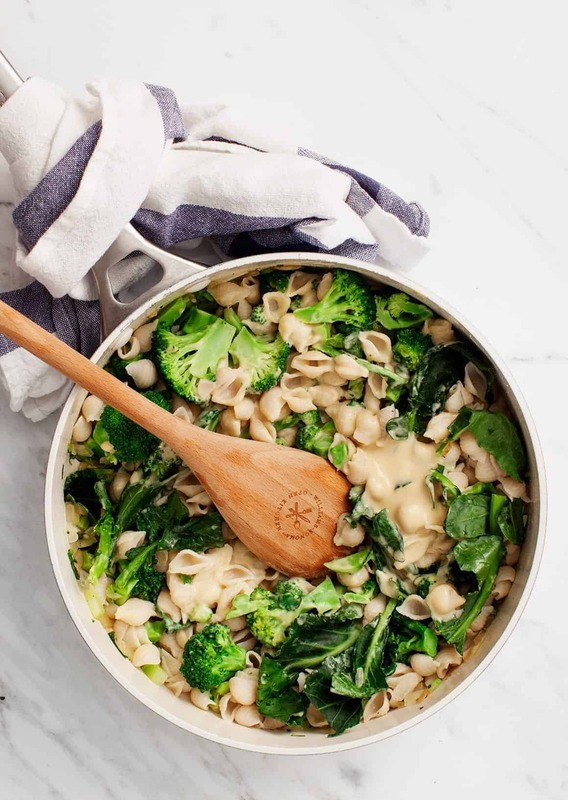 Try this creamy vegan pasta bake with Brussels sprouts or this kale & shiitake pasta! A note about this recipe – it’s not meant to replace your favorite mac & cheese. It’s lusciously bean-y, a little tangy, super homey, and delicious in its own way. 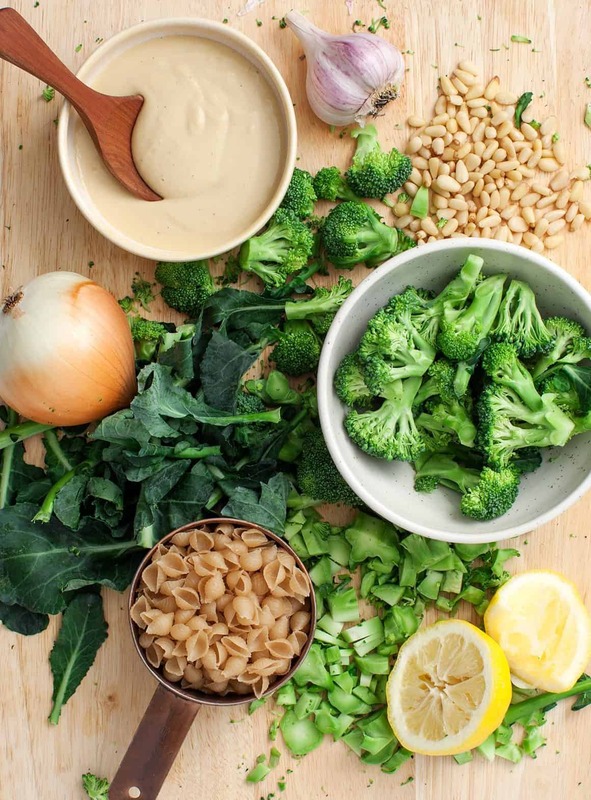 Make the sauce: In a blender, combine the white beans, broth, lemon juice, olive oil, nutritional yeast, garlic, onion powder, salt, and pepper, and blend until smooth. Set aside. Bring a large pot of salted water to a boil. Prepare the pasta according to the instructions on the package, cooking until al dente. Drain and set aside. Heat 1 tablespoon of olive oil in a large skillet over medium heat. Add the onion and sauté until soft, about 5 minutes. Stir in the chopped broccoli stems and cook for another 3 to 5 minutes or until tender. Add the broccoli florets and leaves and a splash of water or vegetable broth. Cover and turn off the heat. Allow the broccoli to steam for 2 to 3 minutes or until tender but still bright green. Add the pasta, then stir in ¾ of the sauce, adding more broth if the sauce is too dry. Season to taste with more salt, pepper and lemon juice, as desired, and portion into bowls. Divide the remaining sauce onto each bowl. Top with the pine nuts and serve with lemon wedges on the side. *If you don’t have nutritional yeast, you can substitute with freshly grated Parmesan cheese. Oh now I really want to organize my pantry, too. It very quickly gets out of control! Lol. 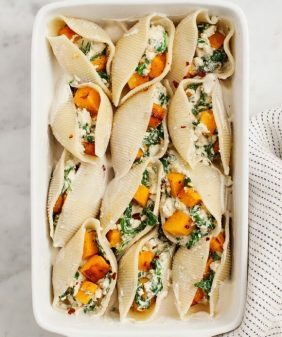 Love this dinner idea. Can’t wait to try the sauce! I bet this recipe tastes as good as it looks!! Looks delicious!! Can the sauce be prepared ahead of time and stored? This looks absolutely PERFECT 🙂 Must-make! This makes me happy. I have a severe tree but allergy and it’s hard to find “cheese” sauces that aren’t made with nuts. I can’t wait to try this. Great recipe! Love this hearty meal! I love how simple and delicious this looks! Hello. Can you explain the use of nutritional yeast in your dish? Nutritional yeast gives the sauce that cheesy flavor, even though it’s not cheese at all. It’s a common addition to vegan sauces, it’s incredible on popcorn, and great on potatoes and probably a lot more things that I’ve never used it for. It’s a staple in my kitchen! Get it cheapest at Trader Joe’s. Making this recipe right now. I haven’t added all the parts together yet, but so far it’s very tasty! Couldn’t resist this. I added a few little items I found hiding away in the fridge that were begging to be included – green pepper, spring onions, cottage cheese. Sprinkled some grated cheese on top too. Delicious, thank you for the inspiration. Is there anything that would work in place of pine nuts? I think some crushed up toasted walnuts (since they’re also a soft nut) would be great! You can also skip them if you like, they’re not essential to the recipe. Has anybody tried this cold? Want to take to a potluck lunch but need to make the night before as no time that morning. Usually I know the answer because I have had a chance to cook stuff ahead and because I love left overs always eat them cold the next day. Loved the taste and texture of the sauce. I subbed Parmesan cheese for nutritional yeast and found it still had nice light taste. I also subbed in some zucchini noodles to lighten it up. I would make this again. Hi! 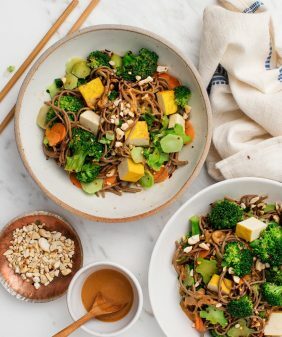 This recipe looks delicious 🙂 Do you have any suggestions on a substitute for bean ingredients…possibly cashews? 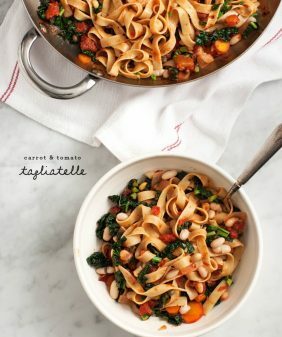 Would love to make this in a way that avoids a bean (& almond) allergies. Looks delicious! Can the sauce be prepared beforehand and stored? Thank you! yes – the sauce will last about 5 days in the fridge. I’d wait to cook the pasta until you’re ready to eat! I made this tonight and both hubby and I LOVED it. I used gluten free quinoa noodles and a good pecorino instead of nutritional yeast, and honestly I think this could sub in for Mac and Cheese for us! It is lemony, creamy, filling, warming and delicious! The perfect antidote to this gloomy day. My one note is that I didn’t like the garlic blended into the sauce and found it too garlic-y as a result. Next time, I will add the garlic in with the onions and broccolini to cook a bit. Thank you for this awesome riff on a cheesy fav! Made this last weekend and LOVED it! Thank you. The beany sauce certainly is flexible for other adaptions too. Amazing recipe! It looks really good! I’m so glad you loved it! Thank you for coming back to let me know! I made this last night and loved it! Most of the time when we have pasta I find I’m hungry half an hour later, but this dish was filling and satisfying–I’ll be putting it in my regular rotation. I added a handful of cashews and a little extra nutritional yeast to the sauce. I also threw in some spinach once the broccoli was done cooking, and added some vegan parmesan and crushed red at the end. I also left out the pine nuts. So good, thanks for sharing! Hi Claire, I’m so glad you enjoyed it! Really, really enjoyed this meal! It came together super quick, filled us up, and tasted yummy! Thanks for a successful dinner! Also, we doubled the garlic in the sauce because that’s just how we roll and it was perfect- not too garlicky at all! Wow!I thought it would taste straight up like beans but with all the spices, it had so much flavor. It really is creamy and delicious. Enjoyed this. It’s healthy but doesn’t taste like it. I will definitely make it just because it’s so easy. So delicious! I am not a fan of creamy sauces..partially because of texture, partially because of nutrition…my husband on the other hand loves them and can’t get enough of them. What a great compromise. The nutritional yeast gives a great texture and flavor. I will definitely put this recipe in our rotation. So this recipe is so good it blew my mind. I am vegan and the ONE thing I crave is cheese. And this did it. LOVE IT. Made this recipe and it was great! I brought leftovers to work the following day and they were still delightful. The only annoying thing was the dishes afterward because I wanted to dig right in not rinse and wash, hahahaha. 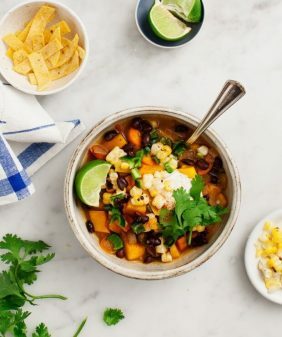 I make this recipe a couple times a month and LOVE that it’s vegan yet I still get protein from the beans along with my carbs and veggies! On a whim, I tried it over brown rice instead of pasta tonight and found it even more yummy and hearty. Highly recommend! Havent tried but excited to try white bean sauce. Was excited to see vegan recipe. Hi Linda, I hope you enjoy the recipe! Awesome easy to follow recipe that taste amazing!